The specially-designed two, five, 10 and 20 dollar notes will have the same value as their US dollar equivalents. 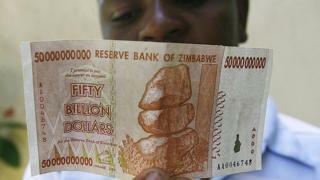 Zimbabwe introduced the US dollar after ditching its own currency in 2009 following sustained hyperinflation. Since then Zimbabweans have been using the dollar as well as a number of other foreign currencies including the South African rand and the Chinese yuan. Africa Live: More on this and other African news stories. But the BBC's Brian Hungwe in the capital, Harare, says that bank customers are not always able to withdraw the amount of US dollars they want because of a shortage of dollar notes in Zimbabwe. The governor stressed that the issuing of bond notes was not the first step on the way to reintroducing the defunct currency, the Zimbabwe Herald newspaper reports. Mr Mangudya also introduced a number of other measures to steer people away from using US dollar cash. This includes setting a $1,000 limit on how much cash can be taken out of the country. He wants to encourage people to make greater use of the rand since a large portion of Zimbabwe's trade is with South Africa. But our correspondent says that people are reluctant to hold rands as they are not confident that the currency will maintain its value against the dollar. He adds that not all shops and traders accept the full range of currencies officially in use. The central bank brought in so-called bond coins of one, five, 10 and 25 cents, pegged to the US dollar, in 2014. Mr Mangudya said the bank was still working on a design for the new notes, but they should be in circulation "within the next two months", the Herald reports.